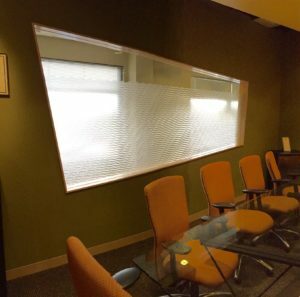 The installation to the right was added to the glass door of our client’s consultation room. We used a Solyx frosted window film to increase privacy for this particular area. The client also requested for their company logo to be displayed in the window film, and we delivered! Whether it’s to improve the privacy of important business meetings, reduce harmful UV rays from fading furniture, or protect your home or office from would-be burglars, Solar Patrol can help. Call (719) 419-9525 today for a free consultation. This particular installation required a high end film that would prevent the customer’s valuable furniture from fading during harsh sunlight hours. The film used for this project is ASWF Legacy 50, and is expertly made using the latest in sputtering technology to handle harsh rays while protecting the inside of the home or office. This film offers an unobstructed view from the window and a non reflective appearance. Leading to the perfect balance between protection for interior items and natural light. If you are interested in having film installed for privacy or protection, or if you have any questions please call us at (719) 419-9525 or schedule your free no-hassle estimate online here! Pictured in the photo above is a recent commercial installation for a new store. For this particular job we used 3M Fasara San Marino film. This film works particularly well for those seeking a little extra privacy and light control. On this installation, the customer was looking for privacy options for the back offices for their new store. Made from flexible polyester material, this durable window film gives the glass a great cut or textured look without the hefty price tag! If you’re interested in installing window tint at your business or office, call us at (719) 419-9525 or contact us for your free consultation today! Pictured to the right is a residential tinting we recently completed. 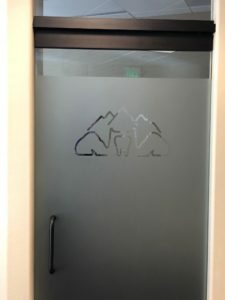 The customer didn’t like the frosted glass that came on her doors and wanted something more natural without making it look cheesy, so we took care of it! For this job we used Solyx, Styx window film. 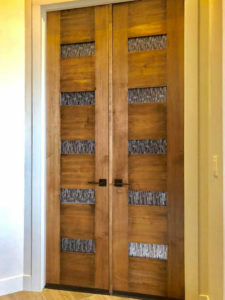 The reddish-brown reed pattern added a great natural effect, and blended perfectly with her wooden door while still letting in light and allowing privacy. 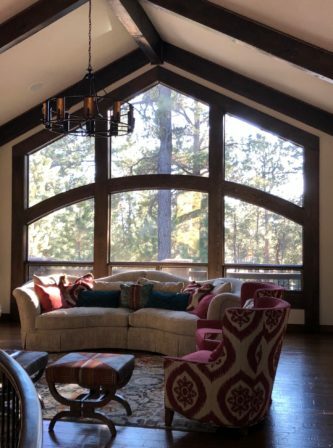 If you have any questions about using privacy or decorative window tint for your residence or business, feel free to give us a call at (719) 419-9525 or schedule your consultation online for free. Pictured here is a window tint installation for a customer’s office using ASWF Reflection 50. This customer stated that he wanted to avoid any fading in his home office from the light coming in through the near by windows. Reflection 50 was perfect for this specific job! It allows homeowner to have a very light silver film, while also having the heat reducing benefits of some of the darker films, and allowing plenty of light come through. 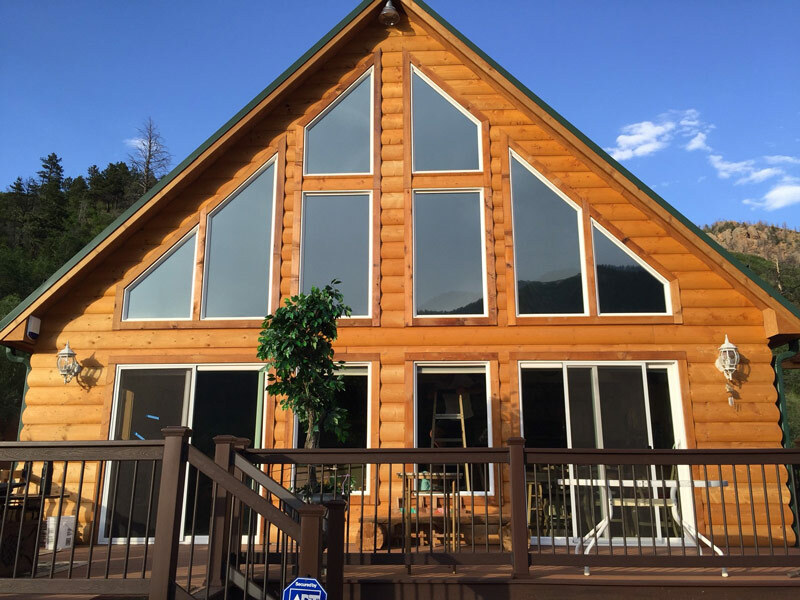 If you are interested in window tint for your home, give us a call at (719) 419-9525 or schedule your consultation online. 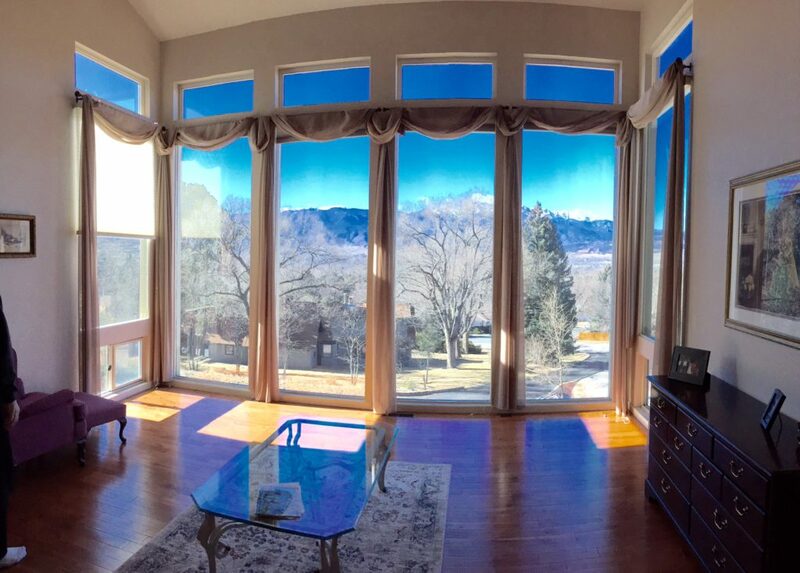 Pictured above is a recent residential window tint installation we did for a fellow Colorado Springs resident. 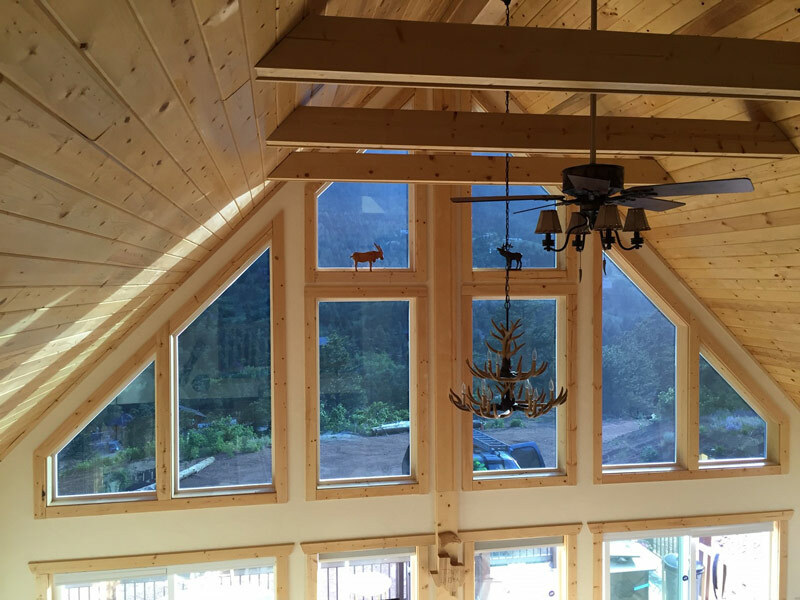 During our initial consultation, the homeowner said they were annoyed and tired of the morning sun that would penetrate these eastern facing windows, resulting in substantial glare and heat progressing throughout the morning into the day. To remedy the situation we used ASWF Sky10. This film substantially reduces the amount of glare and heat transfer, yet maintains visibility. The homeowner didn’t want to ruin the beautiful view that these windows provide so this window film was perfect for the job. 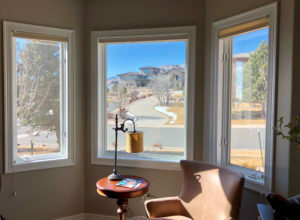 If you are interested in window tint for your home, give us a call at (719) 639-6839 or schedule your consultation online. 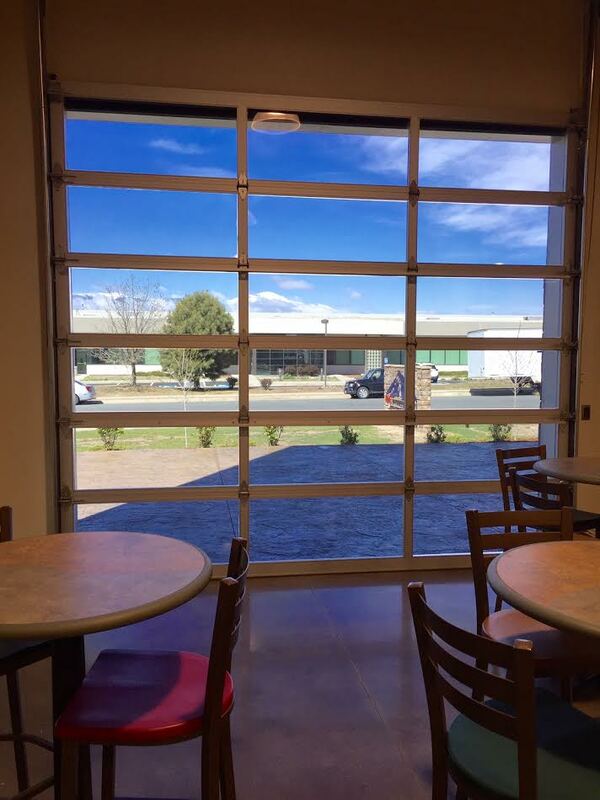 Pictured is the window tint we installed on a garage sliding door for the gathering hall at RMC Distributing. They needed a dark film because the door was letting in far too much light, which was in turn effecting their projector presentations. They didn’t want to completely block out visibility either. Therefore, we used ASWF Moonlight 5 window film for the job. RMC Distributing was very happy with the result and now their presentations will go uninterrupted by offensive sunlight and glare from the untreated windows. 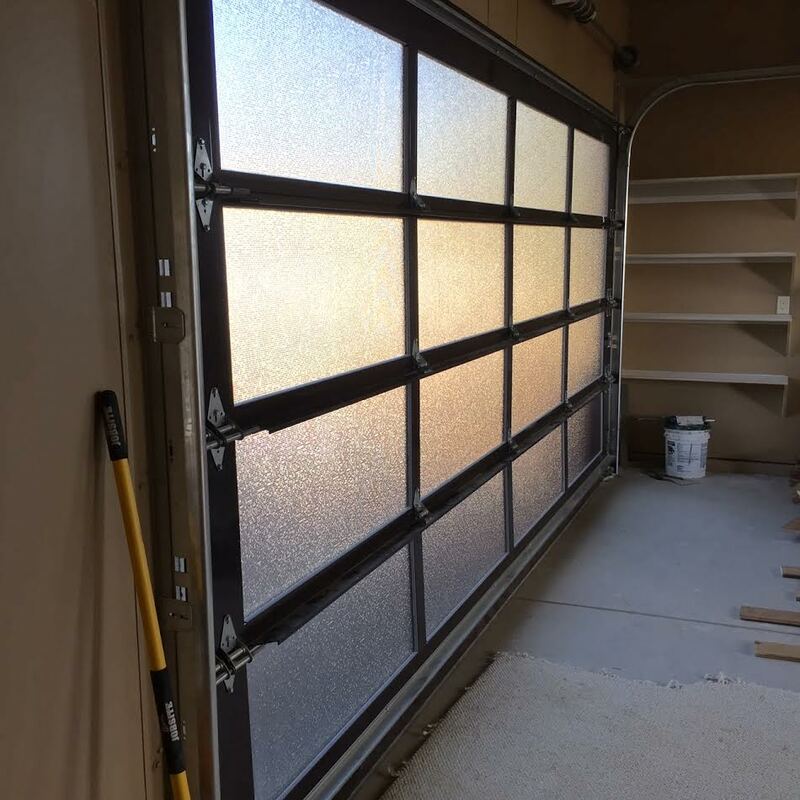 Here’s a recent window film installation we completed for a Colorado resident looking to add a decorative touch to his garage door windows on his modern contemporary home. If you are interested in window tint for your home or garage, give us a call at (719)-639-6839 or contact us online. We offer no-hassle, in-home consultations so you can select the window film that’s right for you. 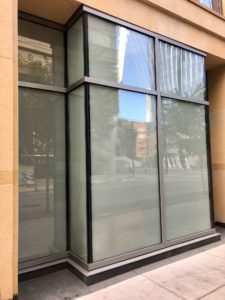 We recently installed SOLYX privacy film in a client’s conference room window. This particular film is the “Mystic Horizontal” pattern. Whether it’s to improve the privacy of important business meetings or protect your office from would-be burglars, Solar Patrol can help. Call (719) 419-9525 today for a free consultation. We help our clients better enjoy the natural beauty of their homes. A view like this is truly spectacular – but large windows can let in lots of unwanted heat and glare. 3M PR40 window film was perfect for the job. It reduces glare inside and out while providing ultra-low reflectivity in low light. Because of this 3M window tint’s dual nature, it can keep warmth in the room during winter and maintain a cool temperature in the summer. Interested in what 3M film like this can do to improve your home? Call Solar Patrol at (719) 419-9525 for a free consultation. Get a FREE, No-Hassle Estimate! Solar Patrol © 2019. All Rights Reserved.